•B,D,G,I are the primary protection. •A,C,H,J are the backup protection. •About 90% of faults are clear by Primary Protection. •So remaining 10% fault are occurred due to failure in tripping of circuit breaker, failure in detection of fault, failure in current transformer or power transformer etc. 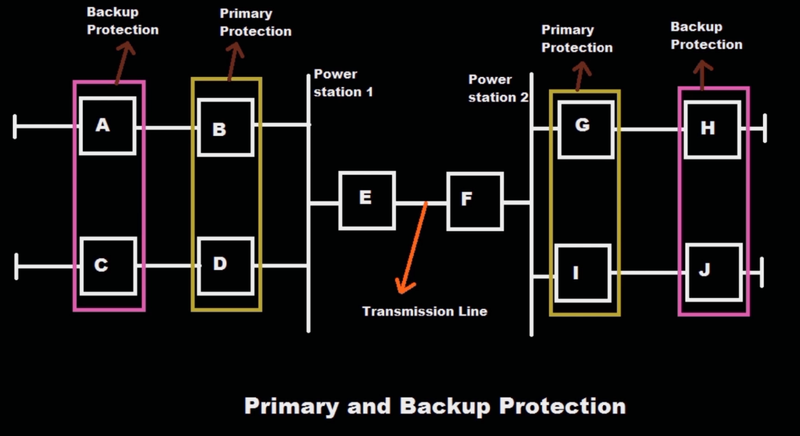 •In power system primary protection is the first line of defense. •Backup protection start protecting the system when primary protection is fails. •So the remaining 10% fault is cleared with the help of backup protection.